Custom Events let you track user activities and key conversions from inside or outside of your app or website, tying them back to corresponding digital engagement campaigns. In this guide, we will show you how to implement custom event tracking both via our web and mobile SDKs and via your internal customer tracking systems, tying all digital engagement activities together regardless of source. Airship provides out-of-the-box analytics for many different kinds of events through our mobile and web SDKs. Many of these events are standard and therefore applicable to all apps and websites, e.g., opens or tag change events. Custom Events, as the name suggests, are customizable to suit the needs of your app or website. 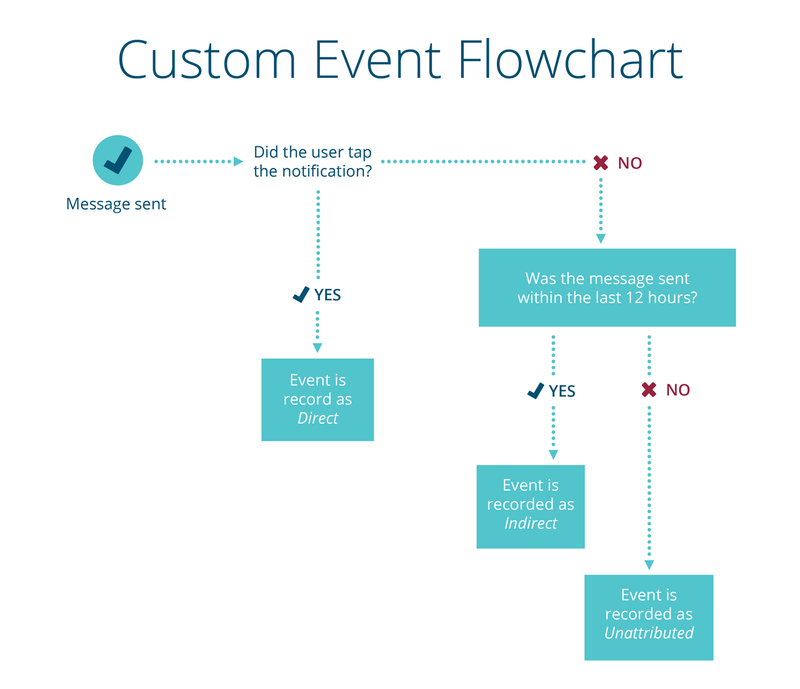 Setting up custom events in your app is easy. We provide ready-made templates for certain common types of events in our iOS, Android, and Web SDKs, and we also provide you the flexibility to set up your own events with just a few lines of code. Custom events can also have properties associated with them. Event properties are key/value pairs of data that can provide more detail and customization to the events you are tracking. Examples include a property for a product SKU on a purchase event, or a category on a viewed video event. Additionally, Connect supports streaming custom events to your business systems in real time. See our Connect API Reference for details. We provide ready-made templates for our iOS, Android, and Web SDKs to get you started with a number of common account-, media-, and retail- related events. To browse the the available templates, see Custom Event Templates. Sample code is provided to get you started quickly. Tracking custom events in your app is similar to adding an Airship segmentation tag, requiring just a few lines of code to run when you would like to record the action. In this example we create an event that assigns a value for advanced analytics reporting. Server-side events are sent through our Server-Side Custom Events API. To submit an event, provide the channel ID or named user ID, a timestamp, a body describing the event, and a session ID. Server-side events that are submitted can be used to create automated messages using Custom Event Triggers. Attributing events to named users can help you better represent user actions and trigger automations for individual users without having to map channels to external IDs. You cannot use a named user-based event trigger in conjunction with tag operations. A named user event automation that also specifies tag operations will not run. .
Server-side events are also used with Airship's integration with Radar, a location platform for mobile apps. See the Intro to Automation: Location Triggers for more information. Events consist of two very basic pieces of information. They tell us that a) something happened, b) at a particular time. Events are distinct from tags, which describe the condition of a user, e.g., a stated preference or information about their app version. Tags represent a user condition, while Custom Events represent actions. A user can be tagged as a purchaser after making a purchase. The user can then be segmented later for sending follow-up messages. A Custom Event can be tracked when a user purchased shoes. This is something that happened, and you may wish to count its business impact across all users. Tags are for targeting users via audience segmentation, while Custom Events inform analytics reporting and trigger automated messages. Audience Tags are useful to identify users for future campaigns. A person who has purchased before may be receptive to a different type of future messaging. A Tag only tells you that this user purchased at least once. Because it is useful to understand how many purchases are made in total during a period of time, we have Custom Events so you can keep track of both types of data. Set specific properties and assign a range of values that must be met in order to trigger automation rules. We recommend starting by identifying the 3-5 most important actions that users perform in your app or site. We recommend that you practice verb-first naming for Custom Events, for the simple reason that these events are meant to track actions and not objects. Tags are better geared for users' conditions, and for audience segmentation. While the 3rd variation above might provide the most detail, you can start with the 1st level of granularity to keep your reports easy to digest and roll-up, and still see which push notifications were driving the most engagement or ROI. Once you have the latest SDK installed and a snippet of code tracking custom events, you'll start to see Event data show up in our Message Reports. These events will appear in each message report, and in an aggregate app report, with information on whether each event occurred on an Airship delivery channel (Landing Page or Message Center), or in a custom location in your app or website. These reports display summary data, and a CSV export option will provide full data you can slice and dice as needed or import into business intelligence or analytics tools. See View Attributed Events for detail about the values in the Event Tracking Report. Because Airship has visibility into both the sending and receiving (via SDK) of each push, our Push Attribution model ties these custom events back to each message in ways that many analytics tools don't -- you can see the full story of conversions following both direct and indirect opens. If a push notification is sent to a device and the user taps on the notification to open the app and complete a custom event, then the event will be recorded with Direct attribution to that push notification. If a push notification is sent to the device and the user does not tap on the notification, but opens the app later that day (within a 12 hour window) and completes a custom event it will be recorded with Indirect attribution to that push notification. If the event is completed after 12 hours (outside the attribution window), then the event will be categorized as Unattributed. If a user completes a custom event during a time when no push was sent, or that user is opted-out, then the event will be categorized as Unattributed. Start by tracking 2 to 5 key activities or conversion points in your app. When naming events, keep the total number of unique event names reasonable, so your reports are easy to read. Event Names must not exceed 255 characters, or they will be ignored. We lowercase all incoming events for consistency in reports, so name your events accordingly. Event Values must be between -231 and [231 - 1], or the value will be ignored. Event Values can not contain "$" or "," characters, or the value will be ignored (decimals only). Send a Message Center Page or Landing Page with the following HTML to set a custom event on the button. In the example below we have created a buy button which when tapped will fire the custom event with an event name of "bought book" and a value of "10.99". Under the hood, a Landing Page is simply a web view, so in order to propagate the knowledge that the event was fired from a landing page to the Custom Events system, we must set the interaction_type to ua_landing_page and the interaction_id to the url of the landing page. For a Message Center Page the UA SDK is able to detect that the event is fired from a Message Center Page so interaction_type and the interaction_id will be taken care of by the SDK. The example below detects if a page is a landing page, and sets the interaction_type and interaction_id if needed, emits an event to the Custom Events system, and writes debugging information to the DOM. Optionally, enable UAirship.close() by using one of the following techniques. There is no need to assign another delegate for WKWebViews. See UAWhitelist for more details on creating valid URL patterns. See Whitelist for more details on creating valid url patterns.